It's futile but nonetheless a fun exercise to wonder what the North American comics scene would look like had Frederic Wertham not published Seduction of the Innocent in 1954. His scathing and unfair attack on comics led to industry-wide censorship. Horror comics, which were enormously popular just prior, was one of the biggest victims. Superheroes remained, however, largely unscathed and today the most recognizable genre of the medium, at least in the western hemisphere. Were horror comics a passing craze or would they, had Wertham not intervened, be every bit as popular today? 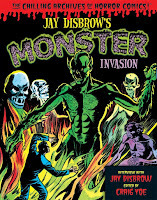 Would Jay Disbrow have been a household name like Stan Lee? I can see why Disbrow still enjoys a fan-following today. His writing, it should be acknowledged is ridiculously cheesy. You could do a drinking game and be quite pleasantly sloshed by doing shots every time a monster walks with "prodigious strides." But this inadvertently humorous quality is no doubt part of its charm for many. The art, however, is quite great. Characters have the semi-realistic look of superheroes and they're expressive and full of movement. The monsters are the real delight though; complete with fur and fangs and slime.